Derek* draws on his graduate studies in communication to develop a winning case and on his many years of public speaking to articulate it persuasively. Derek worked two jobs while attending law school, where he won several course prizes. His determination makes it§ possible to develop solutions for his clients’ legal problems. 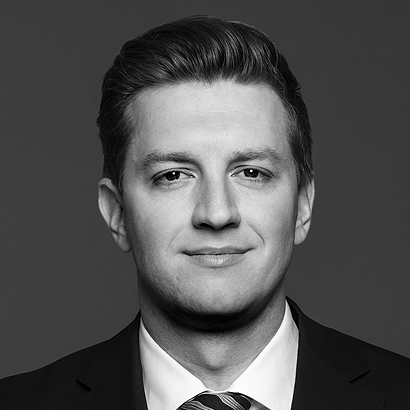 Prior to joining Lenczner Slaght, Derek completed his articles at the Court of Appeal for Ontario, serving as a judicial law clerk. His experience at the Court showed him what it means to be a great advocate and that it is possible‡ to succeed even in the toughest cases. You want Derek on your side. .
Derek is developing a broad litigation practice. He has experience in securities litigation, class actions, commercial litigation, insolvency and restructuring, employment, trusts, and estates. Derek is a graduate of Osgoode Hall Law School, where he won several course prizes. Prior to joining Lenczner Slaght, Derek served as a judicial law clerk for judges of the Court of Appeal for Ontario. Counsel to the defendant employer in defendant an action and injunction concerning allegations of the misuse of confidential information by a former employee.